USA - Bandit Lites has kicked off its incredibly busy 2014 festival season with the CounterPoint Music Festival, where more than 60 artists including Outkast, Foster the People, Pretty Lights, Matt & Kim, and St. Lucia performed on one of the events five stages across Georgia’s Kingston’s Down 5,000 acres. The lighting coordination for the three day event was managed by 3srCreative, a new design firm comprised of designers Seth Jackson, Nathan Scheuer, Brent Sandrock and Jack Rushen, who had worked together previously on Selena Gomez’s tour. 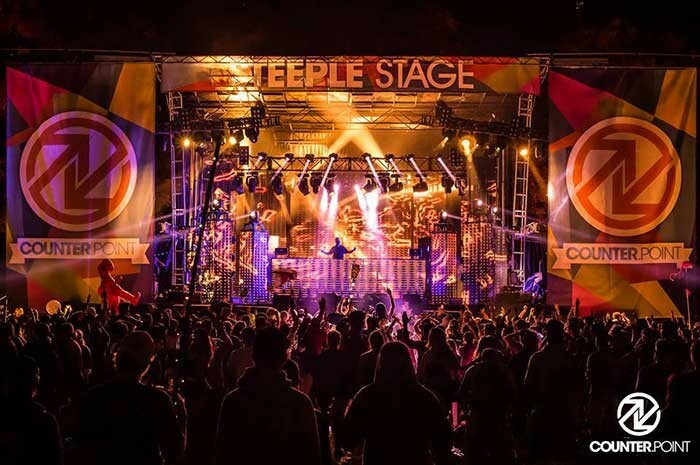 CounterPoint provided a new set of challenges to overcome, as a tour typically consists of one artist, one concept, one designer and (hopefully) one cohesive vision, but a festival can have upwards of eight or nine of those each day. 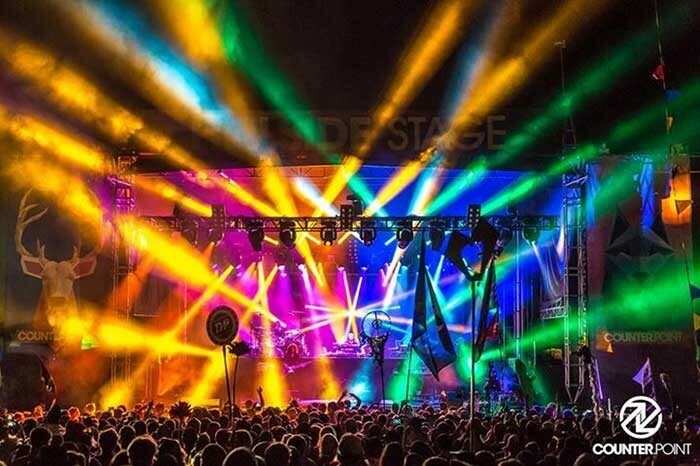 "The lighting design for the music stages was designed to provide as much variety and flexibility as possible given the scope of the different artists coming in," explained Seth Jackson. "We took a look at the basic plots of the headliners and tried to find something that would give each artist something of what they were used to. Most of the fixture choices were based on that; for example, Headliners A, B, & C all had Sharpys, but all had different counts and layouts. Our job is to get everyone as close as possible so they feel comfortable and move quickly and efficiently through the festival." 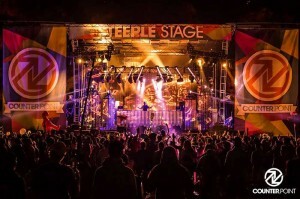 In addition to the two main headline stages, CounterPoint also had several smaller venues throughout the site including a DJ stage. Since that stage only needed to hold a DJ and turntable, 3sr was able to take more liberties with video elements and floor towers that each DJ could rearrange to their liking. Equipment for the main stages and DJ stage included Clay Paky Sharpys, VL 3500 spots, VL 3500 washes, VL 3000 spots, MAC Auras, Martin Atomic 3000 strobes and multiple grandMA 2 full consoles. In addition to the added number of physical shows at festivals, the team at 3sr had to be mindful of the fact each artists wants to deliver their own show and give the audience a full experience; a task that Jackson calls almost impossible, as indoor shows are playing outside, the stage size is different, equipment space is limited and you are physically open to the elements including rain, wind and storms. "Creating a design with as much flexibility as possible to give everyone the key components of their show," Jackson said. ""The challenge in this process is communication. It takes constant attention to keep reaching out to the various artist's teams (who are most likely on the road leading up to the festival, adding to the fun), keeping the constant adaptions and changes updated with the vendor, and keeping the festival directors in the loop." Due to the scale of the event, Bandit provided a sizeable crew to ensure all the stages were operating at the Bandit Standard. The crew included Chas Albea, Dave Butzler, Julie Cox, Andrew Heid, Adam McIntosh, Aaron Swetland, Jason Workman, Andy French, Terese Porterfield, Ty Veneziano, Billy Willingham, Ryan Waldron, Amanda Tullis and Shane Harrington. Shawn Lear was project manager. "I've been involved with Bandit a lot for the last 15 years," Jackson said. "As a result, Mike Golden and I have a shorthand in our communication style that allows things to keep organized and moving forward. I have much the same relationship with a lot of the project managers so it is always a smoother process in the long run." I can’t say enough positive regarding the staffs of C3 Presents and 3srCreative or for Bandit’s Shawn Lear for such a focused project," said Bandit’s Vice President, Mike Golden. "I’ve worked with Seth well long enough to know what he needs to do his job and the staff of C3 most certainly have their Festivals under control and dialled in. The resounding comment from our technicians after this event was that they would happily do any event handled by these outfits in future."